This post will demonstrate how and when the iroute directive is used in OpenVPN. push "route 192.168.1.0 255.255.255.0 10.0.0.1"
PING 192.168.3.1 (192.168.3.1) 56(84) bytes of data. So there is something wrong after all (172.31.0.1 is gwC's external public IP). At this point, some background on how OpenVPN works internally is in order. 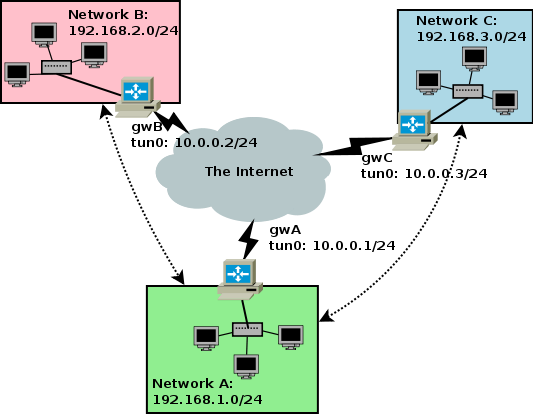 When OpenVPN receives a packet or frame on the tun/tap interface to forward, it encrypts it and encapsulates it into one or more UDP datagrams, which are then sent out to some remote (usually public) IP address where another VPN node will receive it on its public IP, decapsulate and decrypt them, and send them to the local tun/tap interface, where they will be finally seen by the OS. The process also works in the opposite direction of course. If the IP addresses involved are only those belonging to the VPN, OpenVPN has no trouble to associate a certain VPN IP to the public IP address of a remote VPN peer (as long as the addresses were pushed by the server to the clients and not statically assigned). However, when non-VPN packets are involved, OpenVPN needs more information. In our A-to-C example, when gwA receives the packet with src=192.168.1.1 and dst=192.168.3.1, the routing table sends it to the tun0 interface, and thus to OpenVPN. Now, how does OpenVPN know behind which remote peer that destination IP is? That is a necessary piece of information it needs in order to know the destination IP to use for the encapsulating UDP packets. Similarly, in the C-to-A direction, when gwA's OpenVPN sees a packet with src=192.168.3.1 and dst=192.168.1.1, it needs to make sure that it knows how to reach the source address, in order to send replies later. So it's just a different aspect of the same problem. it could assume that 192.168.3.0/24 is behind 10.0.0.3, and thus use gwC's public IP to send encapsulated traffic destined to 192.168.3.0/24. Well, it seems that it doesn't work that way. You have to explicitly tell OpenVPN which network is behind each client. This is where our iroute directive comes into play. After discussing iroute, it's worth mentioning two important gotchas. A similar command would be used on gwB. This way, there is no ambiguity as OpenVPN is forced to use the address in remote for all traffic, so in this setup you can just set external (ie, routing table) routes and traffic will be forwarded without the need for iroute. is there any way to hot change iroute? Let's say behind client C is client D with it's custom subnet. I unplug it from C and plug to B. Is there any way to modify internal route of OpenVPN server without restarting vpn connections? Not that I know of, but I'm not 100% up to date with the last changes. You may have a better answer if you ask on the openvpn-users mailing list. They are, see eg https://sourceforge.net/p/openvpn/mailman/openvpn-users/, there are already several messages for april 2019.
my site-to-site works ! many thanks! Nice article. But i have a question. states that the GwA does not know how to respond to the source and hence we have a problem. But i donot understand how the GwC was able to know that it has to send to the (public ip of) GwA. Could you shed some light to it? It works very nice, since neither client public IP, nothing is listening on them. Only one public IP with domain name is needed. 1) Cumbersome config. iroute, push route, etc. I'm quite new to anything above static routing. Do you think, it makes sense to contribute to OSPF learning? While I personally don't run OSPF over OpenVPN, you can find quite a few people in forums and mailing lists who do, and it seems to work well. I have PC with 2 nics, the nics are configured as router ( windows configuration -regedit) on that router pc i have installed OPENVPN CLIENT. i try to gain connection to 10.8.0.1 but with no success.. This has nothing to do with iroute, anyway you probably need a route to the 172.168.1 network on the VPN server machine. If not, use tcpdump on all interfaces in the path to see where the packets stop. If it's an iroute-related problem, you should see corresponding errors in the OpenVPN log. If not, again, use tcpdump to debug where the traffic stops. This is the best "iroute" explanation I have come across so far. Thanks so much for this excellent explanation! - five years later I was struggling to get site-to-site routing working between a pfSense and a Sophos UTM (Astaro) and the iroute configuration trick was the missing piece I needed. I have an OpenVPN server running on Linux on a public address. I have an OpenVPN remote client running on Linux on a LAN behind a router/firewall. I'm using tun interfaces so am using the "routed" mode. The remote client is 192.168.1.225. The tunnel comes up just fine and from the server I can ping any host on the client's LAN. Also, from the client, I can ping any host on the server's LAN. From the client, I can ping 192.168.2.1 just fine. However, from the server I cannot ping 192.168.2.1, it just hangs indefinitely. If I add push "route 192.168.2.0 255.255.255.0" to the server.conf file, I can no longer ssh to the client, plus I still am unable to ping the 192.168.2.1 host. I've tried so many different combinations but so far have not had any luck. I could send all of config files but thought that might be too much clutter for just a comment type post. I would be happy to provide any additional information that may be useful. I actually have other /30 type clients connected to this same server and all works fine. But, each of those clients only have one LAN behind them. Thanks for any hints you can provide. I think you don't have to push routes to the client, for networks that are behind it and that it should already know how to reach. Otherwise the client will start to try to reach those networks over the VPN, which of course isn't what is wanted. from the server config (you do need the "route" and "iroute" directives though). What you *may* want to push to the client are routes to networks *behind the OpenVPN server*, if any; but certainly not routes for networks that the client already knows how to reach. Thanks for your help Waldner. Removing the push statements did not help. I will continue to experiment by using Wireshark or tcpdump to see where the packets are getting stopped. Also, how did you do the "code" sections in your response? I tried to find a way to do that when I responded earlier but couldn't. It's a normal <pre> tag. This is a great tutorial, thank you! In my setup, I have this one big problem that I can't figure out. I have 2 local networks behind my OpenVPN client and I can reach computers that are on the client's network, but I can't reach the other network. The other network IS accessible from the client, but I can't reach it from the OpenVPN server. I've not been able to find a tutorial that shows multiple LAN's behind a client. Do you know of one? Without more information it's a bit of a guessing game...if I understand correctly, you have to add two "iroute" statements (one for each network that is behind your client) in that client's CCD file. That way the OpenVPN server will know that those two networks are reachable through that client. On the client itself, of course, you will also have to set up routing/firewalling/NAT/whatever correctly for the traffic from/to the OpenVPN server to be able to go to/from the two networks in question. What if two or more networks having overlapping internal IP ranges (shorter prefix length if network A for example) behind their tun interfaces? Or to put in another way, does iroute maintain and process an internal routing take just like kernel does with a normal routing table, using prefix length and metric to decide priorities? AFAICT, the "iroute" directive accepts a netmask specification. thaks very usefull and clear. don't work your howto some inconsitences in reference to http://openvpn.net/index.php/open-source/documentation/howto.html#policy because openvpn "ifconfig-push ip mask" is a mistake in ccd need two ip to end point vpn network as "ifconfig-push ip_peer ip_end_point"
With "topology subnet" (available from OpenVPN 2.1), which is what the example uses, the second parameter must be the subnet mask. The document you're referencing is ancient and assumes that the old "net30" topology is being used.